Easter in Eastern Europe and East Central Europe is an enormously important holiday whether those celebrating are Orthodox or Catholic - the two predominant religions in Eastern Europe that celebrate this springtime holiday. Depending upon religious following, Easter is celebrated either according to the Gregorian calendar, which is followed by the West, or the Julian calendar, which is adhered to by Orthodox believers. Typically, Orthodox Easter falls later than Catholic Easter, though on some years Easter is celebrated on the same day by both East and West. Easter in Eastern Europe is celebrated with special foods, Easter markets, Easter festivals, the decorating of Easter Eggs, and church services. If you happen to travel to the countries in Eastern Europe during this springtime event, you should be aware of some of the local traditions so you can enjoy them all the more. Below, find more information about how the countries of East and East Central Europe celebrate Easter. Easter in Poland is celebrated according to the Western calendar because Poland is predominantly a Catholic nation. Easter celebrations in Krakow are especially popular, and the Easter market there draws large crowds. The majority of Russians consider themselves to be Orthodox whether or not they actively participate in the Church. They celebrate Easter according to the Eastern calendar. Easter games, a special church service, and family activities are a part of Russian Easter observances. The Czech Republic celebrates Easter according to the Catholic tradition. In Prague, the capital city of the Czech Republic, visitors and locals alike attend music festivals and Easter markets. Easter in Hungary is met with the Budapest Spring Festival, which welcomes the warm weather and sunshine with a folk market and special holiday events. The majority of Romanians identify with the Orthodox church. Therefore, Romania celebrates Easter according to the Orthodox calendar. Romanian egg decorating is a coveted art, and Romanians decorate eggs with both the wax-resist method and with tiny seed beads. Slovenia celebrates Easter according to the Roman Catholic tradition. Street vendors sell handmade Easter palms and souvenir and art shops offer Easter eggs for purchase. Croatians celebrate Easter according to Roman Catholic traditions. Zagreb's squares are decorated with larger-than-life Easter eggs and Dubrovnik welcomes the holiday as an excuse to throw a party. 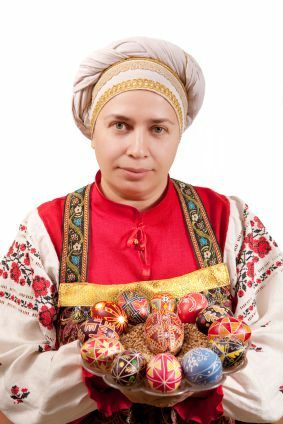 Ukraine's Easter is celebrated according to the Orthodox calendar. Beautifully decorated Easter eggs are a part of a strong Ukrainian tradition that dates back over 2,000 years. Lithuania, as a predominantly Catholic country, celebrates Easter according to the Julian calendar. Lithuanians decorate their own style of Easter egg and enjoy seasonal treats. Latvian Easter is replete with pagan customs surrounding games and Easter egg decorating. One major tradition that has survived is the practice of swinging, which encourages the sun to rise in the sky and the days to become longer. Like their Czech neighbors, Slovaks celebrate Easter according to the Catholic tradition. Their Easter bread is called paska. Decorating Easter eggs with wires is a shared Czech-Slovak tradition. Bulgarians celebrate Orthodox Easter. Bulgarians make Easter bread called kozunak, like the Romanian cozonac. Easter in Estonia combines both modern and historic traditions to arrive at an observance of the holiday that looks much like Western Easter celebrations. Serbian Easter's main symbol is the red egg, which acts as a household protector throughout the year and signifies the blood of Christ. Serbia also takes the game of egg-knocking seriously, even going so far as to arrange a national championship.